The Ninja Inferno unlocks the professional capability of 4Kp60 10-bit cameras, bypassing the internal recording limitations and taking full advantage of the sensor by recording to the camera's maximum colour accuracy, colour resolution and dynamic range. Monitor and record HDR or Rec709 up to 4:2:2 10-bit as Log high bitrate Apple ProRes or Avid DNxHR. Apart from being an obvious companion for 4Kp60 cameras like the GH5, the Ninja Inferno is the world's first HDMI monitor-recorder to accept 4K DCI signals from cameras like the Panasonic. GH5/GH4/DVX200/HCX1000/UX180/HCX1, Sony FS7/Z100 and the JVC LS300. Support for the 4096 DCI standard unlocks cinema recording from these 4K video & mirrorless DSLRs. The Ninja Inferno not only delivers the ultimate solution for 4Kp60 cameras today, it of course is also a great monitor-recorder match for 4K30p and HD cameras. Delivering pristine ProRes recording, HDR monitoring of Log signals, XLR audio monitoring a 1500 nit daylight viewable screen and also gives you the peace of mind, having a future-proof solution for years to come. The Ninja Inferno records from any HDMI device, including Gaming PC's and consoles, in high frame rate HD and up to 4K 60p. Recording in high bit rate ProRes fast tracks the efficiency in editing to speed up the turnaround time for distribution to the internet and by capturing everything in 10-bit the high quality gaming graphics are preserved and text overlays in editing more seamless. Playback at Live Events is possible to larger 4K or HD screens and the advanced controls including playlist generation and slow motion will ensure the crowd feels every crash, punch and explosion. The Ninja Inferno is equally adept in the editing suite as it is in the field with the recorded files dropping directly onto the timeline of all the major NLE editing and grading software with the HDMI input capable of accepting HDR signals to make the Ninja Inferno an unbelievably affordable HDR reference monitor for portable or in studio colour grading. 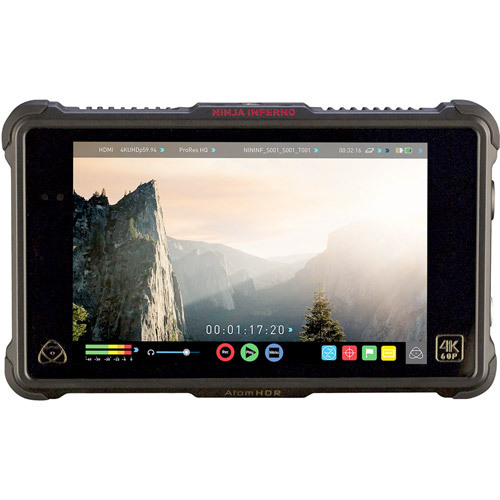 Up your game in the field, recording to high resolution ready-to-edit ProRes or DNxHR & confidently monitor or review in Rec709 or HDR on the 7" calibrated 1500nit 10-bit HDR screen using the suite of scopes. 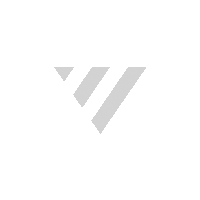 Finish the shoot and forge ahead in the editing suite - just drop your files directly onto the timeline, use XML tagging from the field and even take a PQ/HLQ signal from your Mac or PC to use the Ninja Inferno as an HD grading monitor. 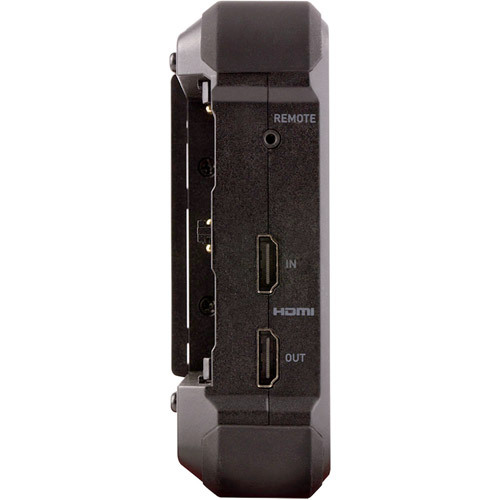 The rugged case with built-in armor houses an arsenal of professional connectivity including full size HDMI 2.0 for signals up to 4K 60p, a HDMI output for playback or play-out to a view finder or other monitors, a hot swappable dual battery system for continuous power backed up with DC mains connectivity, auto HDMI start/stop recording trigger from selected Canon, Sony, Panasonic and Nikon cameras and even conversion of interlace video from your camera to progressive with built-in 3:2 and 2:2 pulldown. Recording 4K 60p within the camera might seem enough but recording with the wrong codec restricts flexibility in post and even risks having your footage technically rejected. Ninja Inferno records direct from the sensor as full individual frames just like film to 4K 60p Apple Pro-Res or Avid DNxHR with 10-bit color information and precise yet efficient 4:2:2 color encoding. 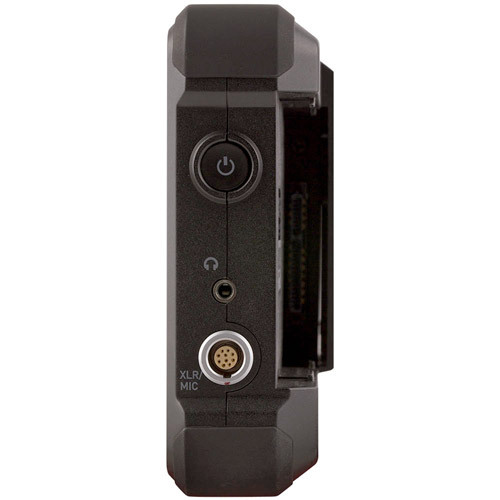 Monitor and record up to 8ch of embedded HDMI 2.0 24bit digital audio. Don't be restricted by the limited audio on most HDMI cameras, truly upgrade to professional levels. We've added an optional 48V stereo XLR breakout cable so you can connect and power external microphones for balanced analogue audio. Audio control is simple with dedicated meters and menus to select channels for recording/monitoring and adjustments for frame delay and gain. The Ultimate Monitor, Recording for Free. We have created the ultimate monitor through end-to-end custom engineering of all components. It starts with a 1920x1200 resolution LCD panel, we add 10-bit processing in highlights and equivalent 12-bit in blacks. This is achieved through the AtomHDR engine honed from Log algorithms of every camera maker to give the ultimate brightness and color representation. Finally the custom Atomos-built backlight with the highest quality precision LEDs means the 1500nits can be utilized for High Bright Rec709 or HDR at 10+ stops. As a creative professional you must always be ahead of the curve - today that means HDR at 4Kp60. Ninja Inferno delivers the simplest, most cost effective and technically superior HDR workflow. 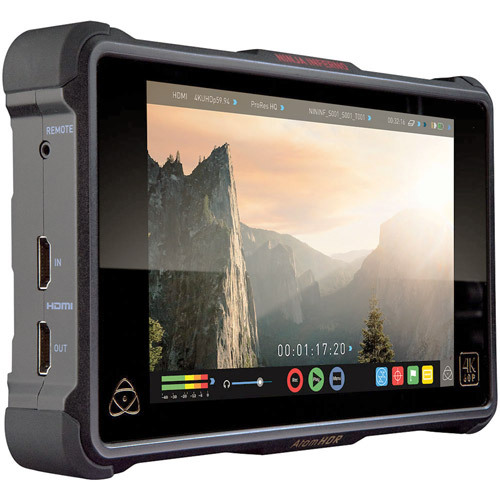 Go HDR today by setting your camera to Log, enabling the powerful AtomHDR engine to expose vibrant natural HDR video & then grade and edit with confidence on any Mac or PC using the Ninja Inferno as your portable grading monitor. The 7" 1920 x 1200 monitor not only has the resolution and pixel density to make every shot look amazing, the high bright 1500nit screen at almost 4 times the brightness of conventional field monitors lets you shoot outdoors without reflections washing out your image. This makes it a great choice for gimbals, Steadicam and director’s monitors, delivering a crisp 4K image without the bulk and viewing angle restrictions of a sun hood. All monitors drift in color over time, which is why all high end monitors have calibration. We've partnered with calibration leader X-Rite to allow their i1DisplayPro to calibrate the Ninja Inferno. With peace of mind on the color front, simply tap the screen to bring up focus peaking, 2:1/1:1 zoom, Zebra, False Color, Frame guides, SMPTE Safe Area, Waveform, RGB parade, Vectorscope, Anamorphic desqueeze and a flexible 3D LUT implementation to upload your own LUTs as .cube files. By combining a recorder and monitor, directors and clients can review shots away from the camera complete with playback control, XML tagging for favorite collation, play list generation and even play out to larger SDR or new & readily available HDR TV's in PQ or HLG. We do all the engineering for you in AtomOS, converting Log to PQ or HLG seamlessly completing your camera to TV pipeline. The Master Caddy system is our secret weapon for recording media flexibility. 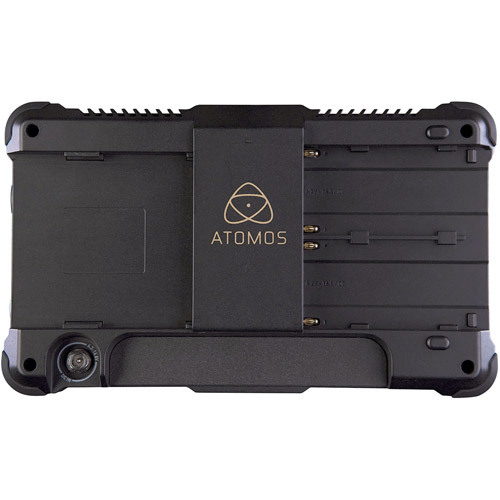 High capacity and widely available 2.5" SSD's provide an affordable solution for long recording times, G-Technology have a custom Atomos caddy that integrates directly into their EV series of Raid and desktop solutions and the Angelbird 4KRAW series integrates heat sinks and a release grip into a custom Atomos caddy for high frame rate and CDNG recording.